9To5 TechNews: Is Blizzard Teasing Overwatch Hero 28 ? Is Blizzard Teasing Overwatch Hero 28 ? Looks like Blizzard is teasing something on the Overwatch Twitter. The tweet is simply captioned "Calm before the storm" and is a short video shot of an alley with various posters. 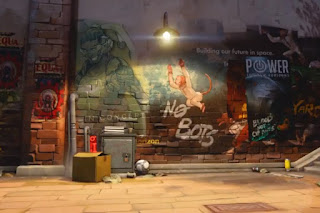 One poster shows a chimp in a space suit tagged with "NO BOTS." The area is not recognizable as any existing Overwatch map. Could this be the first teaser for Hero 28 ? Thoughts ?